Session Description: As AI eliminates work, what will Human Resources in organizations do? Fear about major change is real and the disruption will be massive. How many of you are worried about the future? How many of you are excited? And how many are BOTH? Here’s the thing -- technology is neither good nor bad, it just is. So, what happens if we let go of assessing value and instead focus on designing new systems that are the best they can possibly be? How can we be a part of it? This Future of Work conference will bring together Futurists, HR leaders, and Technology innovators to explore the massive possibilities that lie ahead and our readiness for working together with new technology and new definitions of work. Internationally-acclaimed futurist, Jens Ulrik Hansen, Managing Partner & Founder, Future Associates, will kick off the morning with a keynote spotlighting social trends, global power shifts and new technologies that are currently re-shaping corporate strategy, design, and innovation. We will explore what it means to build dynamic environments through human and machine collaboration. We will experience a world café, where we can look ahead and consider our possible futures and how through experimentation, we can create those futures. Best-selling author, Jarik Conrad, Sr., Director of Human Capital Management (HCM) Innovation for Ultimate Software will lead-off the afternoon. We will discover and discuss key findings from his front-line research: The Future of HR: Reimagining HR for the Augmented Era. We will explore HR’s critical role in radically upskilling workforce and preparing organizations for the future. An interactive discussion among regional business leaders will conclude the day. They will share their experiences and stories about the impact AI and technology are already having on their industries, their businesses, and their talent. Be certain, the way we work in the future will change, whether as teams or as individuals, in multiple locations in the digital realm or in the “gig” economy. The future is upon us and currently transforming business organizations in radical ways. How will these new variables affect business modeling, how we generate and recognize value for solutions, and how we adapt in a general sense as individuals? What are you doing to get ready? Join us on October 2nd as we will challenge our assumptions and shake our current reality. Let’s create the future as we invent frameworks for responding to and preparing for these radical and fundamental shifts that are already underway. NOTE: This program will has been approved for 5.0 PDCs recertification through SHRM. Program is still under review through HRCI. NOTE: When processing payment online, your credit card statement will show a charge from our processor Snazzo Productions (MightECart). 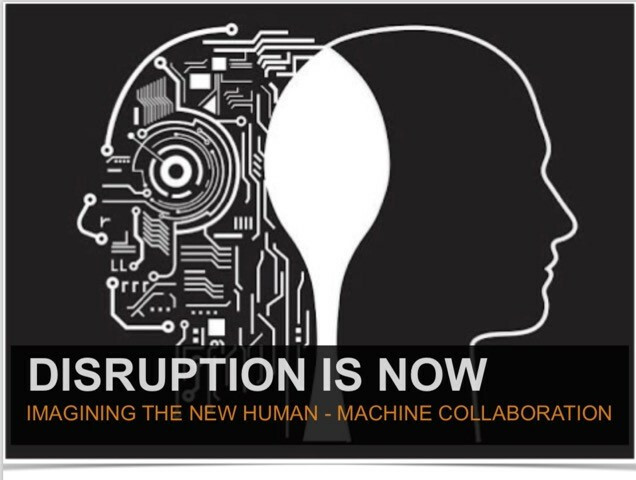 The program Disruption is Now: Imagining Human-Machine Collaboration, has companion documents available for download.